Vintage 4" wide card pictures a policeman on a motorcycle and has a 1 1/2" diameter tin litho badge on it. Packaged in a plastic bag. Both are marked Japan. There are many different badges, so the more you buy the more different we will give you. I don't know the exact number, but there are at least 10 different. The cards are all the same, but the badges say things like sheriff, highway patrol, police or something similar. They all have a different picture or logo on them. Unsold old store stock. CIrca 1960. $5.00 ea. You get both the cowboy and Indian puzzles for $2.50. Vintage 2 1/4" diameter puzzles with the little balls you roll around and try and get in the holes. These are really colorul and have good images on them. We just found them in an old store in Pennsylvania where they had been sitting since the late 1960s. Still in the original cellophane header bags. Unsold old stock in really nice condition. They had been selling them over the years as carnival prizes. Vintage 1960s set of Japanese tin litho cars in original header bag. Includes a police car, fire chief car, ambulance, and taxi. Each car is 2 1/4" long which is bigger than most of these types of vehicles. Old factory stock in excellent condition. Actually unsold stock from the factory in Japan. They got stuck with a bunch of this stuff because none of the packaging had the child protection wording on it. Marked Made in Japan. 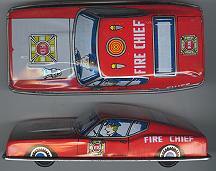 These are very nice and Police, Fire Chief, and Yellow Taxi vehicles are very collectible. These are a steal at this price. 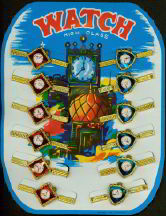 Vintage 10" tall display card with 12 toy watches on it. These are old store stock that was found in unopened cases in dry storage and are in really good shape. Very colorful and circa 1950s. Watches are made of tin with a plastic face and each one is marked "Japan". This kind of stuff is getting very hard to find and these are really nice. You get 10 for $4 (that's 40¢ each). These are vintage unused stock from around 1960. 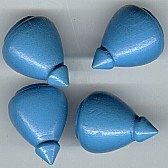 The older heavy hard plastic type. They were made in sealed packages of 10 and so have kept in very good condition. 2 5/8" wide. This is a great price on these. These came from a former employee. Eastern Airlines was considered one of the "Big Four" airlines for nearly 50 years till they hit bankrupcy. Kind of like General Motors current situation except they never recovered. You get 8 for $2 (that's 25¢ each). Vintage 2 1/4" diameter puzzles with the little balls you roll around and try and get in the holes. These are really colorul and have good images on them. We just found them in an old store in Pennsylvania where they had been sitting since the late 1960s. Still in the original cellophane header bags. Unsold old stock in really nice condition. They distributed them as carnival prizes. Only two different types left. These are vintage Keds premiums found in storage in an old shoe store. They come in a cellophane package with directions. They explain how it is a yo-yo with a space puzzle and whistle in the side. The whistle area of the yoyo has the letters of the alphabet with long and short dashes next to them. The directions say that you blew long or short whistles according to the code to send out messages. It also has a list of "astronaut talk" including the term "photon engine" which was a popular idea in the 1950s which is the time period they are from. You may see one of these around once in a while, but not likely mint in the cellophane package like this with the directions. The ones I've seen before are used and don't have directions. In that condition, they go for around $25 each. These should be better. Vintage 1960s tin litho made in Japan friction plane in original packaging. 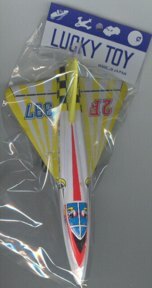 Fairly large 7" long friction toy in excellent unused condition. Unsold stock from the long ago defunct plant in Japan where they were made for export to the US. 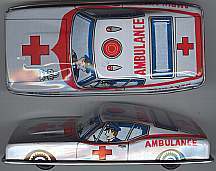 5 1/4" wide vintage friction tin toy ambulance. Marked "Made in Japan" above the rear license plate. These were made in the 1960s and look like Mustang Ford Fastbacks from that era. All tin. Friction motor still works well. Excellent condition. Unsold stock found in an old toy warehouse. I've seen a lot of old Japanese tin, but I've never seen these before. They are very uncommon. 5 1/4" wide vintage friction tin toy Fire Chief cars. Marked "Made in Japan" above the rear license plate. These were made in the 1960s and look like Mustang Ford Fastbacks from that era. All tin. Friction motor still works well. Excellent condition. Unsold stock found in an old toy warehouse. I've seen a lot of old Japanese tin, but I've never seen these before. They are very uncommon. 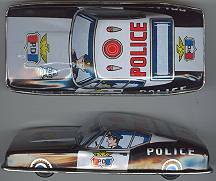 5 1/4" wide vintage friction tin toy Police car. Marked "Made in Japan" above the rear license plate. These were made in the 1960s and look like Mustang Ford Fastbacks from that era. All tin. Friction motor still works well. Excellent condition. Unsold stock found in an old toy warehouse. I've seen a lot of old Japanese tin, but I've never seen these before. They are very uncommon. 4" long vintage 1960s tin friction motorcycle. These are old factory stock from the long closed factory in Japan. They are very colorful and marked Made in Japan. Two of the wheels are tin litho, and the other two work and are powered by a friction motor. We have three different colored ones, so if you order more than one you will get some different colors. Excellent unused condition. Vintage and very unusual magnetic wooden kissing doll set. They are in the original boxes which show some aging, but the toys inside are in great shape other than minor paint flaking. There is one wooden girl doll, two boys, and a wooden stand. All hand painted. Each is about 3 1/2" tall. Inside are printed directions that say "The secret is the girl doll will attract one boy doll and repel the other. The stand should be placed in a prominent place - Girl places her doll in stand and selects one of the boy dolls according to her mood. Boy, upon placing his doll close to the girl's doll can then discover her mood for the evening!" What happens is that the magnets in the wooden heads will make them turn towards or away from each other. These are very unusual and the only examples we've ever seen. Unsold old stock that we recently picked up from an old warehouse in the New Jersey area. Magnetic dolls are very popular with collectors and these are a very old and unusual example. It says they are "Kokeshi Kissing Dolls" and were a "Styson Art Products Company" product. 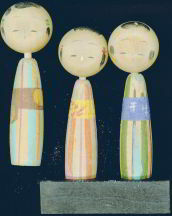 Here's some additional information that I just found about Kokeshi dolls from a Japanese dictionary - "Wooden Japanese female doll, composed of a cylindrical body with motif of polychrome Japanese robe (Kimono) and a round head attached at the top. The fabrication began in Meiji period as a tourist gift of hot springs in Tohoku region (north western region) where farmers had many free time during long winter. According to manufacturing towns there exist a dozen of styles and old kokeshi is an object of collection." You get 8 of these vintage toys for $4 (Great deal - that's only 50¢ each!). 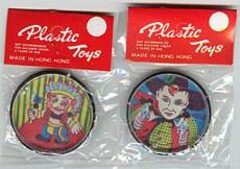 They are 2" diameter carnival prize giveaways. We just found these in an old store in Pennsylvania where they had been sitting since the mid 1960s. One side is a mirror and the other side has a picture of a model. 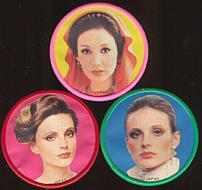 I thought the one was Twiggy, but Chris thinks it is Jean Shrimpton. The one with the hair on top of her head appears to be Bonnie Trompeter, and we couldn't figure out the other one. Email us if you think you know who she is. Most of them are marked Japan, but some don't have any mark. You will get a good mixture. You get 4 for $4 (that's $1 each). Nearly 3" tall vintage pencil sharpeners in original boxes. The globes are made of tin and the rest is hard plastic. Boxes are nice and colorful. 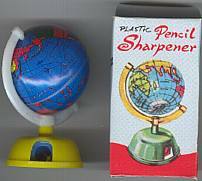 These should sell to pencil sharpener collectors, globe collectors, and 60s toy collectors who want items in original boxes. We just found them in an old store in Pennsylvania where they had been sitting since the mid 1960s. Unsold old stock in really nice condition. They had been selling them over the years as carnival prizes. You get 4 for $2.00 (that's 50¢ each). Vintage wooden mini tops. About 1” tall. Most are blue. Well made. Near perfect condition. Circa 1950. Found in cases marked the “Royal Top Co.” These came from the closed Gulack warehouse in Brooklyn, NY. You get 3 for $3 (that's $1 each). Vintage Wrigley's gum snapping trick. Made of cardboard, paper, and metal and marked "Made in Japan". It has a lever like a mouse trap, so when you offer someone a stick of gum they get snapped by the lever. They still work and are the same size and look just like a real pack of gum except for the spelling of Wrigley's (they spelled it Wriggeyl's). Neat circa 1950s novelty in great shape. Unsold old stock found in warehouse storage. Group of 4 for $2 (that's 50¢ each). 4 1/2" tall vintage licensed flickers (flick to a cartoon version of two different Batman Returns scenes). This version pictures Batman. Good quality. Marked copyright 1992 Ralston Purina Company and DC Comics Inc. 1991 on the reverse. These were giveaways in Ralston Purina cereal around the time of the Batman Returns movie. They are unused factory stock still in their original cellophane envelopes. Hang on to these for awhile and they could be worth some serious money a few years down the road. They are unusual in that they are very large flickers and are very well made. Group of 4 for $2 (that's 50¢ each). 4 1/2" tall vintage licensed flickers (flick to a cartoon version of two different Batman Returns scenes). This version pictures Catwoman. Good quality. Marked copyright 1992 Ralston Purina Company and DC Comics Inc. 1991 on the reverse. These were giveaways in Ralston Purina cereal around the time of the Batman Returns movie. They are unused factory stock still in their original cellophane envelopes. Hang on to these for awhile and they could be worth some serious money a few years down the road. They are unusual in that they are very large flickers and are very well made. Group of 4 for $2 (that's 50¢ each). 4 1/2" tall vintage licensed flickers (flick to a cartoon version of two different Batman Returns scenes). This version pictures The Penguin. Good quality. Marked copyright 1992 Ralston Purina Company and DC Comics Inc. 1991 on the reverse. These were giveaways in Ralston Purina cereal around the time of the Batman Returns movie. They are unused factory stock still in their original cellophane envelopes. Hang on to these for awhile and they could be worth some serious money a few years down the road. They are unusual in that they are very large flickers and are very well made.